Broadleaf Commerce, the open source software provider for building customized solutions, is excited to announce the schedule for the Summer Webinar Series. 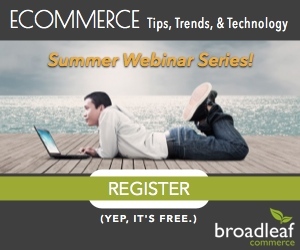 The webinar series will focus on eCommerce tips, trends and technologies. The series will be hosted largely by Broadleaf Commerce and will integrate other industry leaders, including Credera. eCommerce veterans from Credera and Broadleaf Commerce will join on July 22nd at 10am CST (webinar recap: http://ow.ly/zt6J9) for the first of the three webinars. Key Considerations and Tips for an eCommerce Replatform will examine enterprise options, common missteps and best practices in setting goals and objectives for an eCommerce replatforming project. Digital Experience Management with Broadleaf Commerce will launch at 10am CST on August 5 with a focus on how users can deploy a low-cost, holistic platform to deliver true customer personalization across disparate technologies and business goals. The final summer webinar will review Broadleaf?s powerful capabilities in creating an Enterprise-level custom solution for businesses running multiple sites, multiple tenants, and in deploying marketplaces to fit any businesses? plan for growth. The final webinar, entitled Multi- Site, Multi-Tenancy and Marketplaces with Broadleaf Commerce, will begin at 10am CST on August 26. Broadleaf Commerce VP of Marketing and Partners, Brad Buhl, remarked, ?There are a myriad of technology solutions available on the market today. We're excited to demystify the eCommerce industry, creating a clearer path for business owners to attain revenue goals while also lowering costs.? Broadleaf Commerce is the owner of an open-source eCommerce framework targeted at facilitating the development of enterprise-class, commerce-driven sites by providing a robust data and services model, a rich administration platform, and specialized tooling that takes care of core commerce functionality ? providing the framework for companies such as The Container Store, Pep Boys, Ganz, and Vology. For more information, visit: http://www.broadleafcommerce.com.